A slightly different blog post than usual this time as I wanted to tell you all about the work I've been doing with vInspired an organisation connecting young people with charities and voluntary organisations as well as promoting self development. Each year vInspired runs an amazing opportunity for young people aged 18-25 called Team V and after a long interview process I've amazingly made it onto this years Team V 2012! 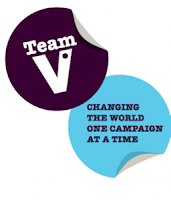 Over the course of the year Team V will run 3 national campaigns within their local communities by recruiting a "dream team" of volunteers to manage PR, media, finance and pretty much any other role you can imagine within a campaign! The first campaign reveal was last weekend and I'm happy to announce that our first campaign will be tackling youth homelessness and promoting awareness of organisations offering help for young people experiencing youth homelessness. I think you'll agree that the statistics around youth homelessness are pretty amazing - and not in a positive way... I was shocked to learn how many young people experience youth homelessness and even more shocked to learn how many of my fellow Team V members had personal experience of homelessness and living in supported accommodation. I'm really excited to start campaigning but i really really need volunteers!! Team V has never had a deaf young person involved before and this year we have 2 - but id love to have a "dream team" of deaf and hearing volunteers who could work together to run this campaign! As you saw from the video there are a number of steps involved in this campaign... contacting a local organisation... running an event or exhibition... and organising an eye catching stunt in order to draw attention to youth homelessness! I can't do all that by myself - so if you're interested in campaigning to raise awareness of youth homelessness, live in the Birmingham area and would like to get involved then please give me a shout! As well as volunteers I could also do with a couple of interpreters or communicators - I have a campaign budget but i'd rather spend it on the campaign than interpreters to help out :) again if you're interested get in touch!